You’re at a league meet or a competition, and you’re up next on a machine you’ve never player before. So what do you do? If you don’t have an inkling of what the rules are or what you’re supposed to be shooting for then the chances of covering yourself in glory are about as likely as a duff bottle of Hirondelle or Spurs winning the Premier League. Not very likely at all, in other words. But avoiding an abject score is vital. That’s because you’ll go much farther in most competitions by avoiding a bad score on any machine than by posting a high score on one. What can you do? Follow the “hit if lit” strategy? Play it safe and avoid putting the ball in danger, shooting for ramps and trying to make each ball last as long as possible? 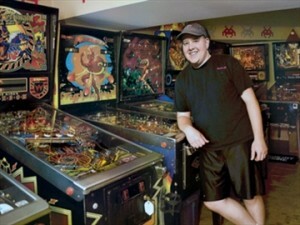 Pretend to take a bathroom break and take a quick tour of the game on The Pinball Arcade on your iPad? Pavlov Pinball put the question to Canada’s Adam Becker, a formidable pinball competitor currently ranked 29th in the world by the IFPA. Great advice, but there’s really no substitute for a little knowledge of the rules. 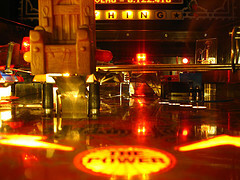 So here at Pavlov Pinball we’ve decided to compile a collection of five second game guides to pinball machines you may encounter, provided by top international competitors. They’re short enough to read and remember before you step up and play, with just enough to give you a fighting chance of racking up a respectable score. We’ll be adding five second game guides to more games over the coming weeks and months, and you’ll be able to find them all on Pavlov Pinball’s Five Second Game Guide page. Shoot the chair when lit to start modes. Shoot the main ramp to relight the chair. Hit the bookcase to spell GREED and lock balls at lights to start multiball. Shoot left ramp for Jackpot. If there is a ball save, hold the left flipper for super skill shot and shoot the visor as that will lower it instantly. Shoot the lock shot, lock three balls and play multiball. Plunge the ball and hold up the right flipper, pass the ball to the left and lock three balls. Keep playing multiball over and over again. Triple stack is the way to go. Depending on the settings it’s six shots up the centre ramp for Strike an Arc, and you lock the balls for Highwire. Get one of the ringmasters up, and have three shots left for Strike an Arc, and your three locks lit for Highwire. Then shoot the ramp three times and complete the ringmaster for the triple stack. Shoot Casters’ Club to lock balls, play multiball, shoot Casters Club again to light Jackpot. Collect Jackpot by shooting the left loop. Collect three Jackpots and Super Jackpot is lit on the captive ball. Shoot the flashing shots to spell body parts. 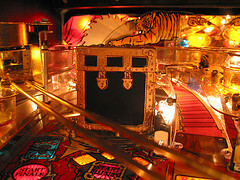 Each body part collected awards a score multiplier and lights one ramp for multiball. Once all parts have been collected shoot the vari-target to complete the robot. There are three lock shots, one on the right side of the playfield, one on the left and one way up the centre at the back of the machine. Lock three balls for multiball. You can also start multiball by going down the outlane and using the outlane flipper to hit the standup at the end of the inlane. This will raise the middle ramp to lock a ball and start multiball. Shoot the skull to light lock, put a ball in the skull to fire the gun, shoot the gun at the lit target to start multiball. The left loop, left saucer and skull are lit for locks. Lock the balls to light the Jackpot at the gun. Shoot the gun at the lit target for Jackpot. The skull will now be lit for Super Jackpot, load the gun and hit the moving light. Shoot the garage to get to the upper playfield. Shoot under the TV to start a TV mode – this will place a timer on the clock. Shoot the couch to lock three balls and play multiball. If at any time your timer is running low on the TV, start another mode or shoot the Otto shot to restart the timer. Spell MAGIC to light lock. Balls are locked on the orbits around the trunk. Shoot the trunk to start multiball. If you hit the trunk within the first five seconds of multiball you get 100 million. Also spend lots of time shooting the left loop for THEATRE letters and bonus multiplier. Choose to play as Autobot. Mudflap and Skids is a 2 ball multiball. Shoot the lit Autobot Triangles to start modes. Make sure you get as many Playfield Xs as you can by completing the inlanes. Multiball is available on Optimus or Megatron. Drop the Megatron target to lock balls, or shoot the Optimus shot to raise the ramp and then hit Optimus for multiball. End of Line is the most valuable thing is this game. Every time you shoot the right ramp to feed the left flipper shoot the scoop to collect the End of Line Jackpot. Light cycle multiball is lit on the scoop by collecting light cycle shots. Shoot the Quorra shot and the right ramp to set up your End of Line and light Quorra multiball. Shoot the left and right ramp to spell gumball and light lock. Lock three balls or shoot the left ramp if lit to start multiball. Shoot the right orbit for Gumball and to get the white ceramic powerball. Shoot the powerball back into the gumball machine for Powerball multiball. Hit the green standup targets on the right and left of the No Way Out hazard to light lock. Lock three balls for Whitewater multiball. 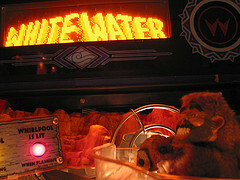 Collect Jackpots with the upper right flipper on the upper playfield. 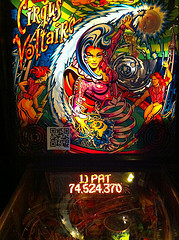 For big points try and have 5X Playfield mode running before starting multiball. Bash Wolverine as many times as necessary to start Wolverine multiball. Before that try and have Sentinels running so you can stack both at the same time. The green targets light lock for Magneto. Lock four balls to start Magneto multiball, the number of heroes you collect before the multiball determines which shots will be lit for jackpot and how much they will be worth. What’s the score with women’s tournaments? Thanks Gene X! An app is a great idea – I’ll look in to this if no-one else is. Nice idea for an article! Would be really great to see those mini-tutorials in an app. Can’t imagine that smartphones will be ruled out at tournaments in the future. Knowing those things is nice, of course, but you have to pull them off, too. Also, everyone can look up those tips, so this should be fine. I love these mini tips, can’t wait for the next instalment. These are great for me, because I have a 20 year gap in my pinball knowledge, it puts me at a real disadvantage in tournaments. However, great article, thanks a ton!